Pineapple jam is one of the yummiest jam. My choice for jam is always Pineapple jam. 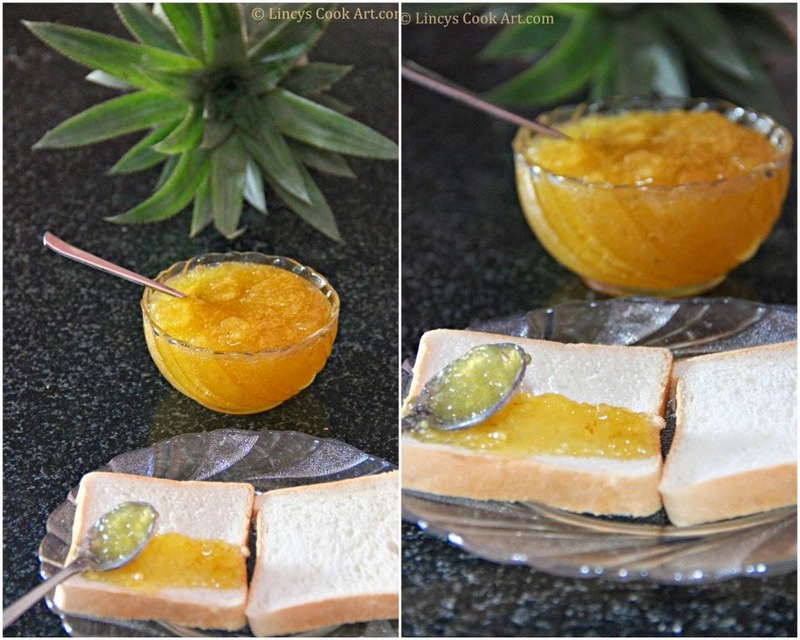 In my native place its pineapple season and a pineapple was there at my home and i planned to try this jam. Pineapple jam comes handy when u make tarts or dessert with fruits, perfect jam for brushing on top of fruits. Perfect side dish for Biryani. It is a super easy jam without pectin, artificial colours or any preservatives. Without pectin you can achieve a superb spreading jam consistency. The sweet cooking smell of pineapple filled all over my home. Super easy jam within minutes without any pain. Peel and remove the black colour eyes lightly from the pineapple and cut the edges of the pineapple. Cut the pineapple into four pieces and remove the center core from four pieces. Roughly chop the pineapple pieces and puree them inside the blender jar; Set aside. In a pan add sugar and water, turn on the heat to dissolve the sugar in water. Add the pineapple puree and stir well to combine. Once it starts to boil light frothy layer will form on top of jam. Dont worry it will disappear once the jam thickens. When the jam get thicken, the frothy layer starts to disappear and the jam starts to become a clear glossy yellow colour. Now add the lemon juice, mix well and put off the gas. Switch off the gas when the jam is almost thick but little runny if you drop the jam from spoon it has to fall easily. Because of the sugar content the jam thickens further after cooking. Once the jam cools down transfer the jam into a clean sterile bottle and tightly close with a lid. You can store this jam for a week in room temperature and can be stored in refrigerator for a month or more. Yields around 250-300 ml jar of jam. Note: Adding lemon Juice is optional in this recipe. If you are planning to use this jam immediately and finish it is not necessary. Lemon juice can be replace with citric acid available in shops too. Lemon juice is added to prevent crystallization of jam. Initially dissolving sugar in water properly is the essential step to avoid crystallization. In-case if your jam crystallizes after a day or two add a teaspoon or two of water and melt inside oven or on stove top your jam will be fine. love this vibrant color jam. love your awesome clicks. Easy and delicious jam, love the color..
Looks perfect! I love the way you have clicked the jam. I just need to make this pineapple jam asap after seeing your lovely post. Thanks for simple step wise instructions! Very fruity and glossy jam;;love with my toasted bread slices..
Love to enjoy this jam with some bread slices. If i am using citric acid how much proportion should I use to substitute lemon juice. It's looking yummy. I am going to try it out today. Added red Chile flakes, so sweet with a little Chile kick..